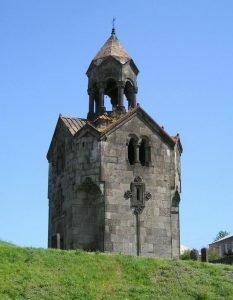 Since the introduction of computer RPGs, randomly generated dungeons are everywhere. Software developers prefer to call them procedurally generated rather than random because they aren’t truly random; they’re created according to a rigid procedure. 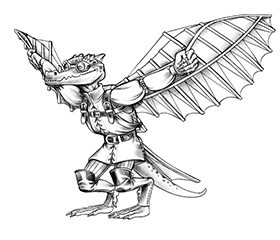 Developing a procedure that spits out satisfying dungeons is a popular problem among programmers, and the web is full of fascinating blog posts about the many approaches people have found for solving it. Procedures for generating dungeons randomly are, however, much older than personal computers. The first substantial paper-and-dice random dungeon generator I’m aware of is the one created by Gary Gygax and published in Volume 1, Issue 1 (Spring 1975) of Strategic Review. It was later republished with only minor changes in the original DMG. Hundreds more followed in the decades since. The process of randomly generating a dungeon is amazing when it works well. This can be a game—or a gamelike activity, anyway—all by itself. I’d wager that most of you have spent hours creating dungeons with geomorphs, random tables, and heaps of dice just for the joy of seeing what comes out. Even the person who created the procedure can be surprised by the results despite knowing all the possibilities beforehand. The key is in the unexpected combinations and the fact that a dungeon is more than the sum of its parts. At first glance, randomly generating a dungeon seems easier than purposely designing every aspect of it, but that’s true only if the procedure already exists. Designing a ten-room dungeon is less work than creating a system for generating an infinite number of ten-room dungeons—trust me. The savings come in bulk; if you foresee the need for an infinite number of ten-room dungeons, or even just a lot of them, then creating a system is more efficient than hand-crafting each dungeon individually. The best of both worlds is when someone else creates the system. All you need to do is learn how to implement it. The dungeons this system produces are somewhat abstract. It doesn’t actually draw corridors between rooms, for example, but only indicates that a connection of some sort exists. That connection might be a simple doorway or it might be a lengthy corridor. We’ll explore that subject more in a later article; don’t get hung up on it just yet. 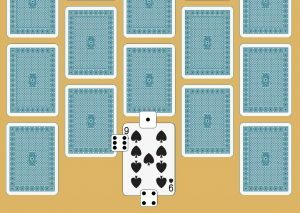 This first article introduces the basic procedure for laying out the cards and for generating connections between them. Next week, we’ll delve into what’s actually in those chambers. Start by shuffling the deck. 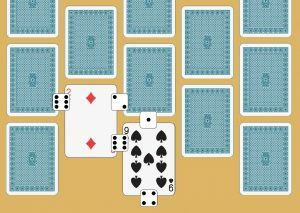 Deal out 25 cards, face down, in the 5-by-5 pattern shown in the illustration. 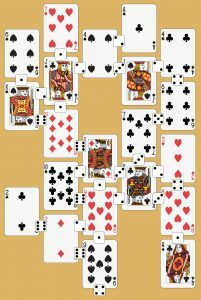 The card at the bottom center of the layout is the entrance; or, if you’re laying this out in front of players at a table, the entrance could be the middle card in the top row, where it will feel more natural to players. The illustrations assume the entrance is at the bottom, but as you’ll quickly see, any card could kick things off. Flip the entrance card face-up to show that it’s been entered and explored. We need to locate paths that connect the explored card to adjacent cards and lead farther into the dungeon. To do that, roll three six-sided dice. Now imagine that the faceup card is a dial with 1 at the top, 2 at the upper right, 3 at the lower right, etc., as shown in the illustration. Place the dice you just rolled around the card in the positions that correspond to their numbers; a die that rolled 1 goes at the top, a die that rolled 2 goes at the upper right, etc. If two dice rolled the same number, return one of them to the spare dice pool. Doubles mean this room has only two exits instead of three; ignore one of those dice and return it to the spare dice pool. Triples mean it has only one exit. If a die turned up 4, place it at the bottom of the card to mark the entrance. If a 4 wasn’t rolled, place a spare die there anyway, as a reminder. In our example, the first room (9 of spades) has an entrance at 4 and two other doors at 1 and 6. Let’s assume our explorers move through the door at 6. The card it leads to gets flipped face up (revealing the 2 of diamonds), indicating that room has been entered, and you roll three more dice to locate exits. This time, the rolls are 2, 3, 6. Placing the dice around the card to mark those locations, we see that position 3 is already occupied by the door from the first room (6). 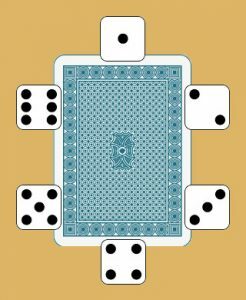 That die gets returned to the dice pool and doors are marked at positions 2 and 6, as in the illustration. Continue in this fashion, moving from one card to the next, to map the entire dungeon. Follow these rules to answer the inevitable questions. Other than the entrance, dice that indicate a door leading out of the dungeon are ignored; return them to the dice pool. If doubles indicate a door out of the dungeon, however, then that location holds a hidden or previously unknown passage back to the surface. Dice that indicate a door where there’s already a door are ignored and returned to the dice pool. Dice that indicate doors into previously explored but unconnected chambers raise the question, “why didn’t we see this door from the other room?” These dice can be handled in one of four ways. Option 1 is to ignore that result and return the die to the dice pool, the same as if it was a double. Option 2 is to treat that result as a one-way door or magic portal that can only be opened from the current room. Option 3 is to assume this door is obvious from the current room but cleverly concealed from the opposite side; now that you know it’s there, it can be opened from either side. Option 4, which is suitable if you’re mapping the dungeon ahead of time instead of generating it on the fly during a game session, is to add the new door to the layout the same as any other and move on. Keep adding doors until all the cards are flipped face-up or until every path has hit a dead end. If every path dead-ends while some cards are still face down with no connections, those cards are removed. They’re not part of the dungeon. Using these rules to finish our example dungeon leads to the layout shown in illustration 5. This simple layout procedure provides plenty of opportunities for variations. Cards can be arranged however you like, not just in a five-by-five layout. A grid of 25 cards produces a dungeon about the right size for an evening’s exploration or a worthwhile side trek. A layout smaller than nine cards tends to be dull, especially if more than a few cards wind up being unreachable. 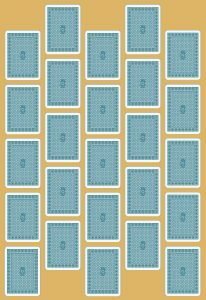 Seven-by-seven is the largest square arrangement possible with one deck of cards, but an arrangement can also be rectangular, ovoid, or asymmetrical—or it can use more than one deck of cards. The entrance doesn’t need to be along an edge. If the entrance is through the ceiling via stairs or a pit, or via a portal, it can open into the dungeon anywhere. Instead of laying out the entire grid beforehand, cards can be dealt into position from the deck as they’re needed. 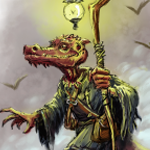 You can predefine the limits of the dungeon or let it sprawl wherever the dice dictate. A door that’s indicated by doubles is trapped, locked, jammed, or obstructed in some other way. Next: What’s in this dungeon? A die that’s returned to the pool. Do we do anything special with those? Or do they simply join the others for a fresh 3d6 roll on the next room? It’s just a die that goes back into the heap to be available for possible use later. This is so brilliant and simple. I love it. Thanks so much!